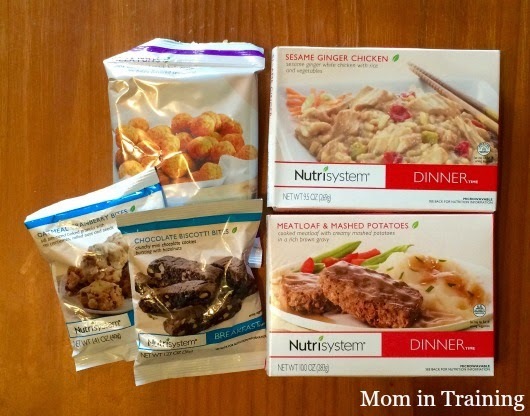 Nutrisystem recently sent me a special package containing five of their new foods. I was pretty excited about it because that meant I got to try some new foods and step away from the norms I've been eating over the last few months. I tried the Meatloaf & Mashed Potatoes for dinner the other night and I have to say it was so good that I ate the entire thing before I even stopped to think I should have taken a photo of it. It was a good full portion and paired with a side salad made for a complete dinner. I had the Pizza Puffs for snack last night and those were pretty good too. I actually found myself going back to the bag for more when I realized I had already eaten the entire bag. I decided to hang onto my two new breakfast items for when I need something on the go since I know I'll be out early a few days next week. I went ahead and put them in my car so they are there and ready just to be safe. Last but not least I'm sure is the Sesame Ginger Chicken which I plan on eating tonight. I decided to eat it tonight because I'm cooking something similar for my family for dinner and thought it would be nice if we all had something along the same cuisine line together. And now time for the weekly results. As I had mentioned last week I did a mid-week weigh in and was down to 172.2. Well, I am happy to report that the increased weight loss has kept going. As of this week I am down to 170.5. The ability to exercise has really helped and so has finally feeling better and not being sick and run down all the time. I'm really looking forward to my final few weeks to see just how effective the plan can be for me now that I can fully take advantage of it. The pizza puffs look really good!